Plug and Fly....simply add your own RX and Battery! The Zephyr is packed with truly innovative features, the first being the highly compressed EPO foam, as well as being tough, the foam has a super smooth texture, adding to it's aerodynamic performance. The wings are carbon reinforced with pre-tensioned glassfiber strips on both sides of the wing to prevent twisting during high-G manoeuvres, likewise the fuselage uses a square CF rod down it's length, plus external glassfiber rods. The V-Tail is also CF reinforced and for extra stiffness is secured to the molded rear skid assembly. The large bi-lateral air intakes have been designed to maximise fan performance while minimising drag, which combined with the ultra-thin airfoil and clean, low drag airframe offer jaw dropping performance both on and off the throttle! The quality of the V-70 is second to none, metal gear servos are included as is a powerful 70mm EDF unit and programmable ESC. Assembly is fast and the Zephyr also features a 2pc removable wing for practicality. Durafly engineers have overcome the theoretical drawbacks of an EDF glider by combining the efficiency of the V-70 airframe & power train with the ability to carry a large lipoly to offer you great flight times on top of amazing performance! One of the first things to strike you when flying the V-70 is how beautifully balanced it is, the pilot feels immediately at home and locked in, even at high speed. The aerobatic ability of the Zephyr is as mind warping as the speed, combine this with the impressive off throttle performance and you have an amazingly wide flight envelope but open that throttle and you are greeted with a turbine like sound like no other EDF Jet, it's so addictive! 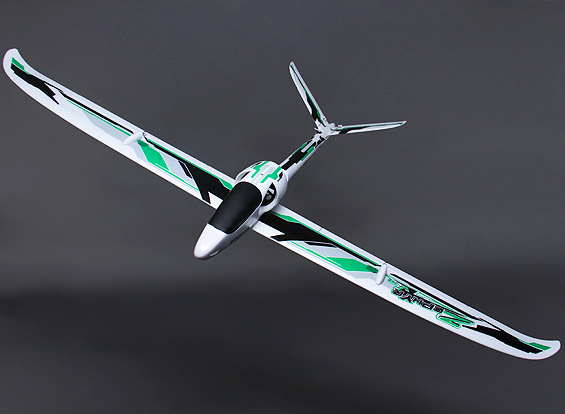 Jaw dropping Looks, high speed performance, amazing aerobatic ability, quality, durability, practicality and innovation.....the Durafly Zephyr V-70.....the ultimate foamy!